Vintage Denby Greenwheat Pair of Cups & Saucers,. Perfect Condition. Denby Midnight Blue Glazed Stoneware. Excellent clean condition,used with light wear including utensil marks. Denby Imperial Blue Tea/coffee Cups And Saucers X 5. Condition is Used. Dispatched with Royal Mail 2nd Class. 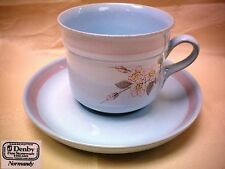 A wonderful pair of Viceroy DENBY tea/coffee cup and saucers. These have had a tiny amount of use and are in perfect condition. Denby Marrakesh cup and saucer been in a display cabinet owned by my mother in law. 6 cups and saucers available. In excellent condition. Other cups and saucers see my other ads. Can combine postage. Two Denby Marrakesh cups and saucers unused. 6 cups and saucers available. Been in my mother in law display cabinet for a number of years. Need to de clutter. Excellent condition. Can combine postage if any other cups bought. Vintage DENBY Cups & Saucers x 6, Green Chevron Pattern. Vintage DENBY Cups & Saucers x 6, Green Chevron Pattern.. Dispatched with Royal Mail 2nd Class. Pretty Denby Monsoon Veronica: Teapot, Sugar Pot, 6 x Tea Cups and Saucers. Rarely used due to house move. I will attempt to send by hand courier to keep intact if you are within a reasonable distance. 2 Fine Stoneware. In the Blue Dawn design. Sorry but I cannot accept foreign cheques/checks/money orders. Denby Greystone Cup & Saucer I have four of these for sale. Condition is Used. DENBY Cotswold, Tea or Coffee cups and saucers X4. Condition is Used. Dispatched with eBay delivery – Shutl 2-3 days. Denby Shiraz Cup & Saucer Set x 2. Saucer Width 17cms. Immaculate Condition. Cup Height 8.5cms Width 10cms. All Proceeds From This Sale Go Directly To Willow Wood Hospice. Saucer dia 175mm. Cup dia 105mm. Denby Imperial Blue Tea Cups (7) and Saucers (8). Condition is Used. Dispatched with eBay delivery – Shutl 1 day. DENBY 1970's Cotswold. Breakfast Cup & Saucer Unused. Brown Textured Design. BY DENBY FINE STONEWARE - HANDCRAFTED - ENGLAND. IN THEIR MUSTARD BROWN RANGE. 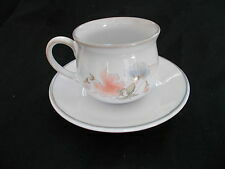 PAIR OF TEA or COFFEE CUP WITH SAUCER. CUP - SAUCER X 2. Saucers are blue and white with green rim. DENBY Cotswold, Tea or Coffee cups and saucers, Set Of 4. Condition is Used. Dispatched with eBay delivery – Shutl 2-3 days. Here is a joblot of Denby Encore/Delphine crockery in their lovely sweet pea design. Denby Greenwich Tea Cups And Saucers x 4. All are in immaculate condition as they have never been used. Cu p is i n go od u se d conditiont he re a re s om e ki ln s pi ts i n th e bo wl. S ee photos. T he re i s a littlen ic k in t he i nn er r im o f th e sa uc er a nd t wo o n th e ba se r im - s ee photos. Designed by SoYin Ching in 1993. One cup and saucer good condition for age. 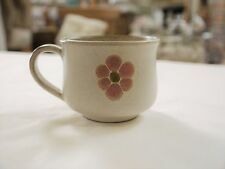 Denby Encore Sweet Pea 3 Tea Cups & Saucers Tableware EXCELLENT CONDITION. Dispatched with Royal Mail 2nd Class. Denby ," Daybreak " coffee set. A great little coffee set. Denby Gypsy Cup And Saucer Set X4. Condition is used and in very good condition. Dispatched with Royal Mail 2nd Class. **DENBY Imperial Blue tea cup**. Condition is Used. Dispatched with Royal Mail 2nd Class. Denby Boston Blue - 5 Tea cups and saucers. Very good condition, no chips or cracks. Dispatched with Royal Mail 2nd Class. 4 beautiful sets of Denby Halo cups and saucers. Excellent unused condition! Would make a great wedding present or housewarming gift. Denby ENCORE Coffeecup and saucer. Demitasse.